Laying the groundwork for enhancing the Partner Locator tool found on vmware.com. Simplify the experience so customers can easily and intuitively find partners and learn about VMware products and solutions. 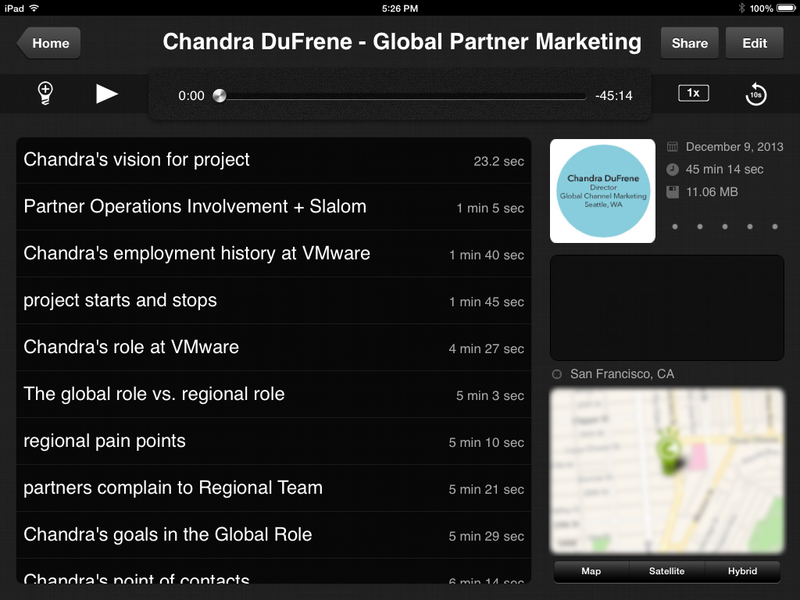 Improve the partner’s experience by helping grow their marketing pipeline and improve their relationship with VMware. Drive more revenue for VMware. This effort had had many starts and stops in the past with multiple business stakeholders within the VMware organization expressing different requirements and business needs for the tool enhancement. My role was to perform stakeholder research, align stakeholders on the requirements and conduct an analysis of competing sites. I conducted 1:1 interviews with 24 different stakeholders within the VMware organization to understand their perspectives, pain points, ideas and requirements for improving the Partner Locator tool. Each interview was recorded, allowing me to revisit the interviews to identify emerging patterns and additional insights. Interviews were recorded using an application called Highlight, and was used throughout the research phase to identify pain points and patterns across interview candidates. I identified 28 unique pain points from the stakeholder interviews. 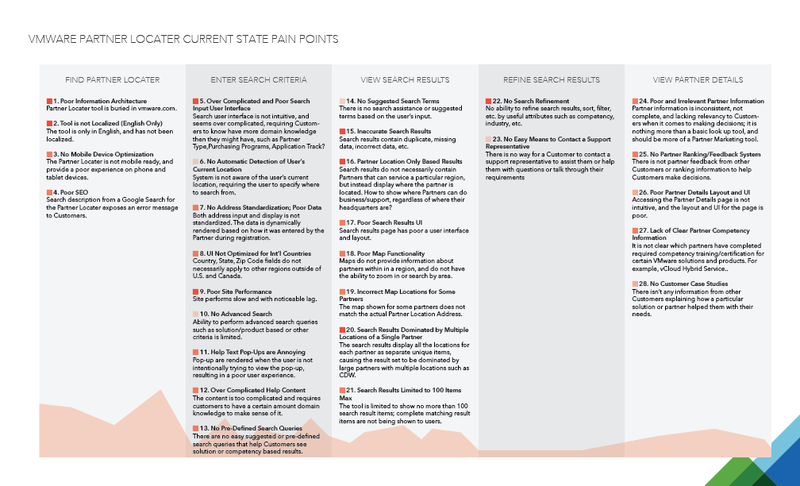 Each of these pain points were categorized and grouped with other pain points based on where customers would experience the pain when using the current Partner Locator tool. Pain points categorized by the tasks a user performs when using the tool on vmware.com. I synthesized my research findings into unique pain points that I plotted on a matrix showing how painful the aspects of the current state tool are as well as how many people addressed the same perspective. Based on these two variables, I laid out the overall priority of each pain point ranging from Very High to Low. Prioritized pain points from interviews based on the severity of the pain and the number of times the pain points was mentioned by various stakeholders. After familiarizing myself with the pain points, I was able to identify high-level requirements to address each of the pain points. Categorized high-level requirements based on identified pain points during stakeholder interviews. In order to begin thinking about how to solve for the identified pain points, I plotted the high-level requirements on a matrix measuring the value of the requirements as well as the effort needed to design, build and implement it. 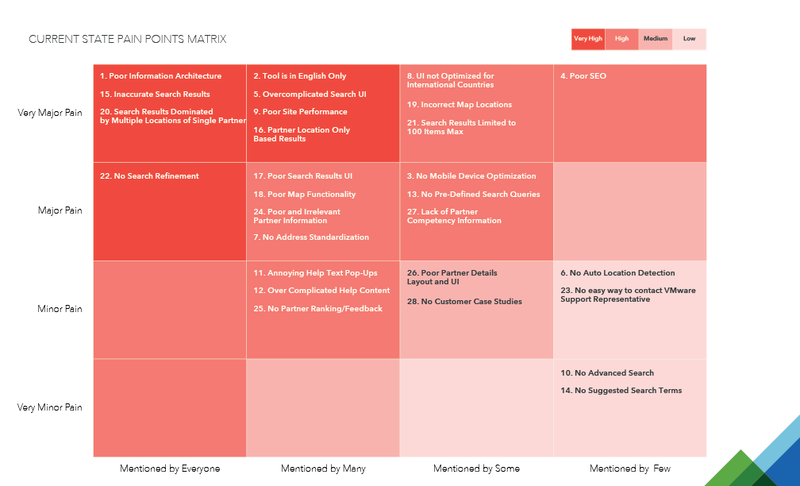 This matrix then became an input into the strategic planning and roadmap for improve the Partner Locator experience. 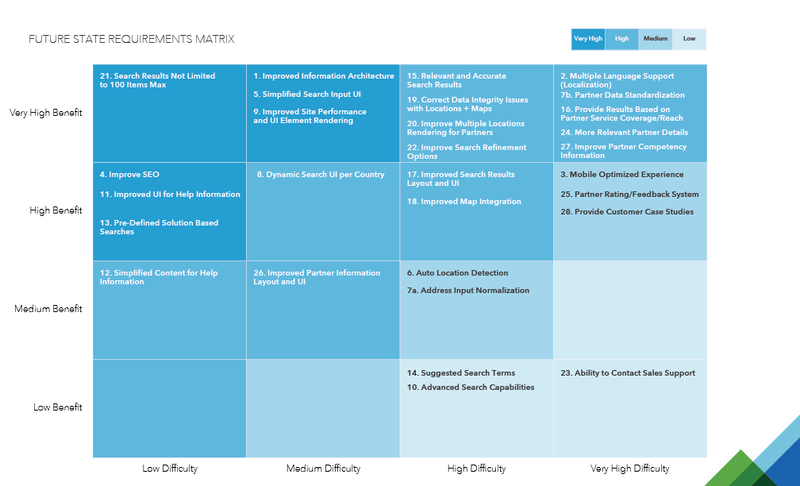 Prioritized high-level requirements based on benefit and level of difficulty to implement. I explored the interaction details and functionality of the three competitor sites and captured detailed annotations for the features using the following categories: well-executed features, functional features needing some improvement and poorly-executed features with significant paint points. Usability annotations based on my assessment of Cisco’s Partner Locator tool. 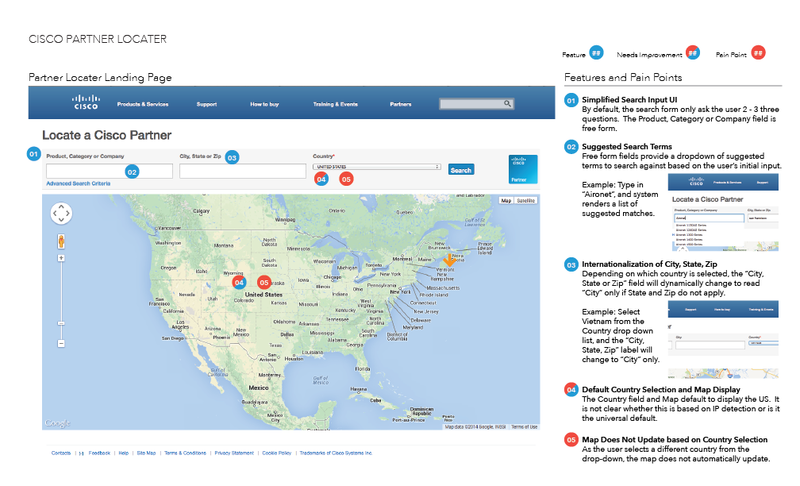 Experience map created for the VMware Partner Locator customer experience. 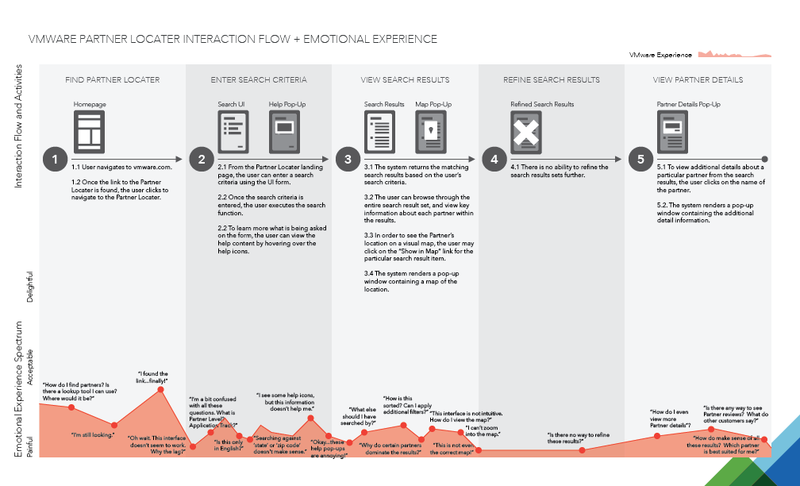 Although the high-level tasks are the same across competitor sites, the detailed user interactions and user interfaces are different and result in varying emotional experiences for customers. 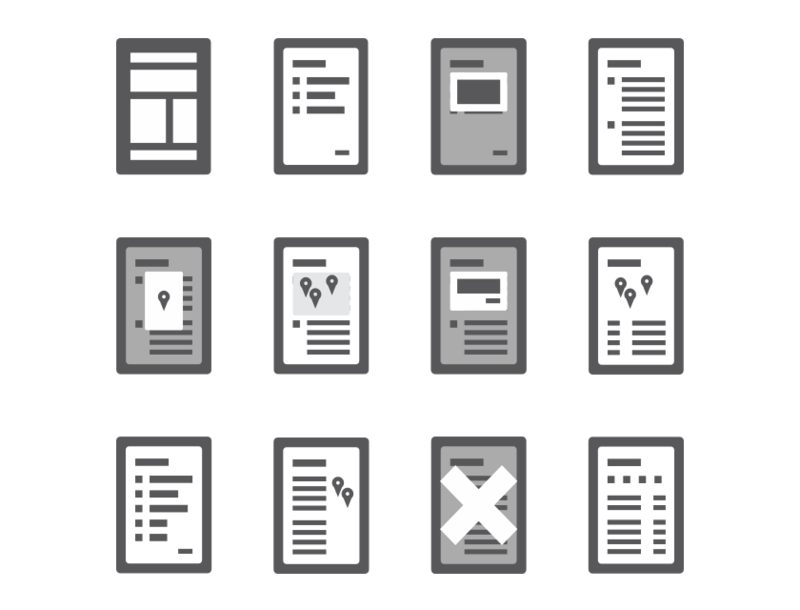 Custom icons created to represent the different user interfaces used by the competitor sites. At the bottom portion of each map is the Emotional Experience Spectrum, ranging from Painful to Delightful. As I looked at the interaction details and usability for VMware and the competitors, I hypothesized what the typical customer must be feeling and thinking as they interact with and use the partner locator tool. Lower plotted points reflect frustrations and painful experiences for customers, while more acceptable and delightful experiences are plotted higher on the scale. For the VMware experience map specifically, I reflected the commentary that I heard from the various VMware Stakeholders during my interview sessions. Once I had established the VMware experience baseline, I then overlaid it against each of the competitor experience maps to help visualize where the shortcomings are and where the opportunities for improvement are relative to the competition. 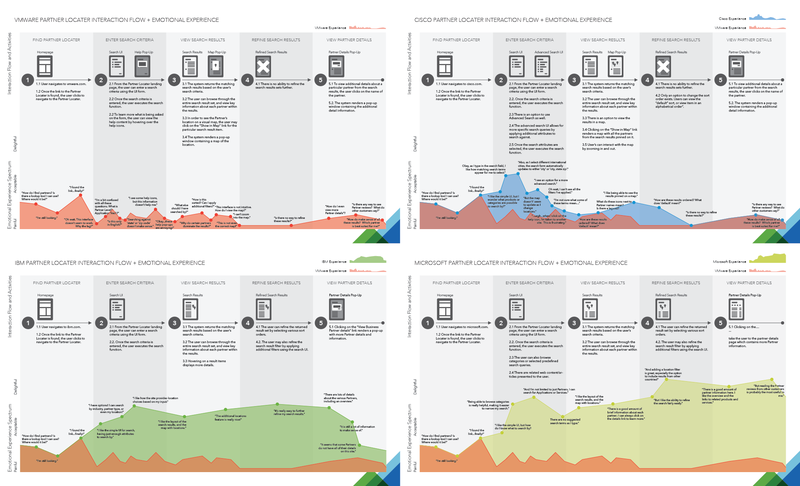 Experience maps for each competitor tool analyzed against the VMware experience. 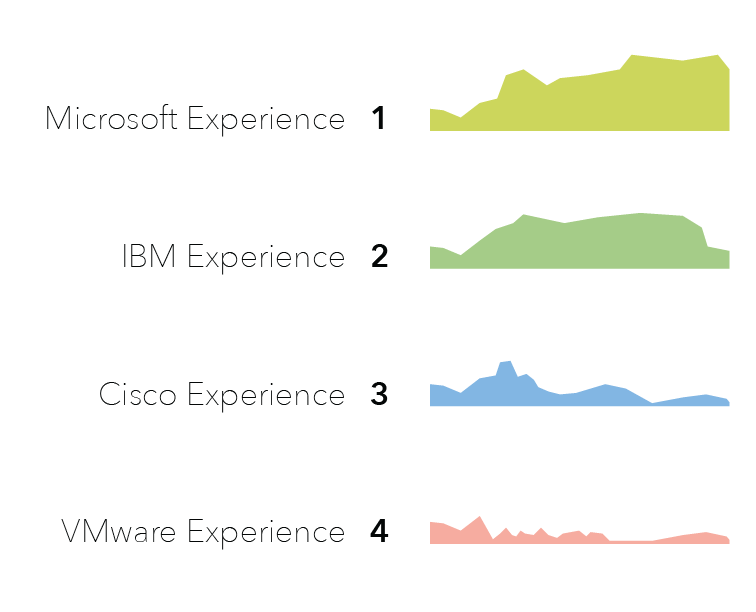 When comparing the overall VMware experience against the other competitors from the customer’s perspective, the VMware experience ranked the lowest, while the Microsoft experience ranked the highest. The end goal of my research was to establish the high-level requirements based on stakeholder research and more importantly to make sure that the various stakeholders within the organization were aligned on the established requirements. In addition, the competitive analysis only reinforced the pain points expressed by each of the stakeholders. 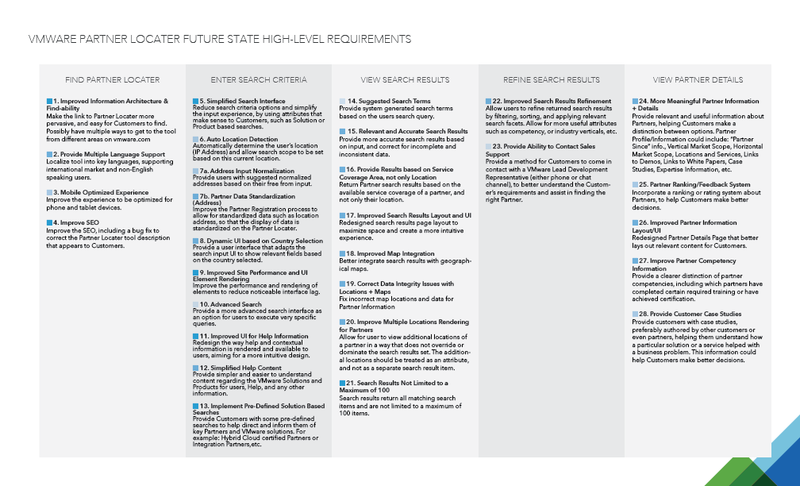 As I wrapped up the Assessment Phase, which included Stakeholder Interviews and Competitive Analysis, I recommended going into an Iterative Design Phase to continue with the enhancement of the Partner Locator Tool. The goal of this next phase would be to start with the shared understanding and high-level requirements derived from the Assessment phase and to dive deeper to define the detailed functional requirements and design. The key to the iterative process will be to collaborate with the VMware technical and development teams to assess the feasibility of the proposed functionality and help define the scope and future releases. 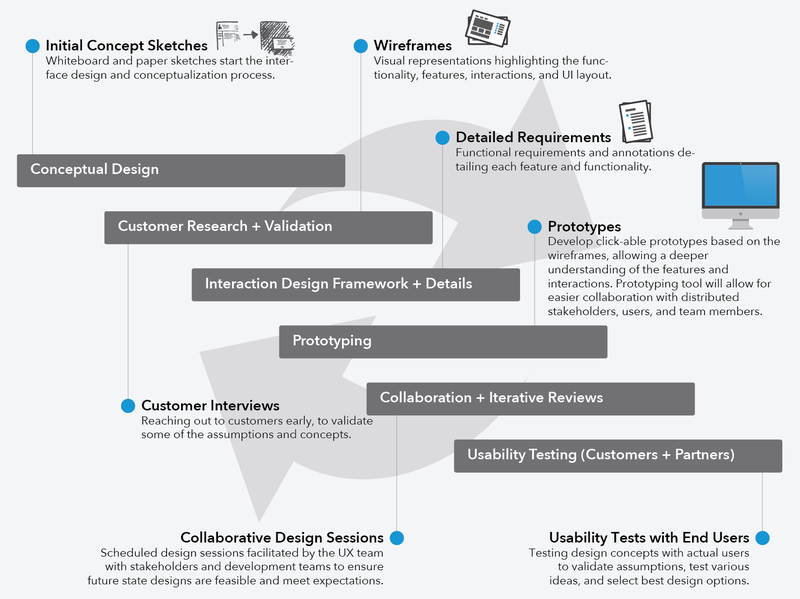 Proposed design methodology and process used for next phase of work.